WORLD PREMIERE OF LAZER TEAM AT FANTASTIC FEST 2015! Austin, TX - August 26, 2015 - The sci-fi comedy LAZER TEAM, the first feature film from renowned creative studio Rooster Teeth, will celebrate its World Premiere atFantastic Fest 2015 in Austin on Thursday, September 24, at Alamo Drafthouse South Lamar with cast and crew, including director Matt Hullum and stars Burnie Burns, Alan Ritchson, Colton Dunn, Michael Jones, and Gavin Free, in attendance for a post-screening Q&A. "It's a tremendous honor to hold the World Premiere of our first feature film in our home town," said LAZER TEAM director and Rooster Teeth CEO Matt Hullum. "Getting to this point has been an incredible journey, and we couldn't have done it without our talented cast and crew, the generous Indiegogo backers, and all of the fans that have supported us along the way." 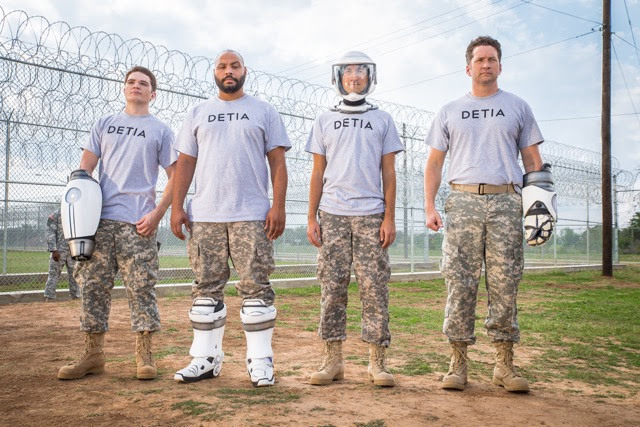 LAZER TEAM begins decades ago when the Search for Extraterrestrial Intelligence project received a one-time signal from outer space, which was never decoded. Or so we were told. Unbeknownst to the general public, the secretly translated signal said two things: we are not alone, and conflict is coming. Working in secrecy, the US government has been training a single Champion of Earth to face the coming battle. A suit of immense power, delivered by alien allies and meant for Earth's Champion, is instead stumbled upon by four small-town losers who become genetically bound to the armor. With the government chasing after them and desperate to remove their new equipment at ANY cost, the foursome must learn to use these strange alien devices, train for a battle against an omnipotent enemy, and not kill each other in the process. Mankind's darkest hour needs our brightest team. They may not be strong, smart or talented...but they're LAZER TEAM.